This guide assumes that you are familiar with keywords, the concepts, terminology and metrics that describe them. There are many techniques and types of keyword research that can each play a different or complimentary role in the ongoing endeavour to find new valuable keyword. We cover a range of common techniques for performing keyword research in this and other guides in this series. This guide looks at the most basic and standard form of keyword research. Choosing the right keywords or the best keywords and having this rolled up into a keyword strategy is pivotal for any site. There is no point spending time, money and effort targeting keywords that no-one searches for or that you can’t rank for. In some cases, small tweaks to the target keyword can lead to dramatic changes in the volume or quality of traffic. Cheap and nasty SEO agency agencies will often target keywords like “physiotherapist London physiotherapy massage”, they seem relevant and are easy to rank for because no-one searches for them. Low value keywords are easy to rank for! You need to know that the keywords you are targeting are both relevant and have the potential to deliver traffic to your site. We cover the long-term strategy and how keyword research feeds into this in another guide on keyword strategy. There are many avenues to finding and ultimately finding and targeting keywords... There are also many factors in determining what to target and when to target it, often this is a balance between cost and pay-off, how much effort do you need to put in to get more out? In the following sections, we cover a goof range of these techniques, bear in mind that they can all provide unique value and are consequently not always relevant to your goals. Understanding what you want out of a keyword research project is paramount to its success… A new site with no history will not have keyword ranking or traffic data to pick through… A small local business might not have a load of relevant like-for-like competitors with analysing… A large global business, might need to target their keyword research to different languages based on region. There are no one-size-fits-all solutions, and the options available to your will limit the processes that you must go through. The first technique that we want to look at, is likely the most common, although the data used and the formula applied may vary, the overarching process and aim is always the same. The aim of this technique is to do a set of research as narrow or wide as required, to identify new target keywords for your site. The benefit of this, is that it doesn’t require competitors, you aren’t copying or being influenced by what others are doing… You can always do this regardless of how new or big or small or global a site is. 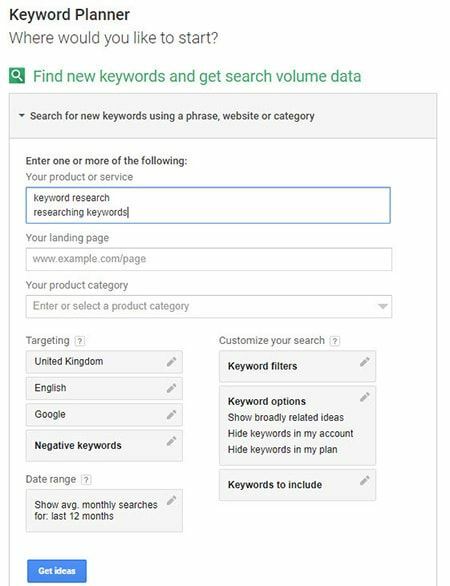 We use Google’s Keyword Tool for this for the search volume and competition metrics as well as suggesting other keywords… But you could in principle use any tool that provides you with keyword suggestions and just pull in the data for those keyword from AdWords. This can be dealt with at scale systematically with a program like Excel using the concatenate function and fixing cell references, it’s pretty easy to expand a small or large seed keyword list. Using Google’s Keyword Tool, we copy small groups of relevant keywords into the Tool… Depending on the size of the job and the size of the seed keyword list, you may be limited in how you do this. In an ideal world, each individual keyword is put in one at a time to Google’s Keyword Tool; then the full list of suggested terms is downloaded. 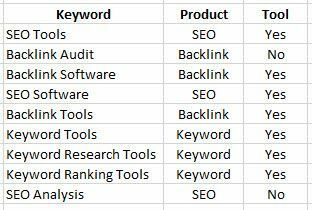 As you can see there are a lot of options here, you can learn more about the keyword tool in another one of our guides. There are variations of this, you could copy URLs into the keyword tool, getting Google to provide suggestions based on the content of the URL / domain. This should leave you with a concise list of unique keywords in a single CSV or Excel file. This data comes as standard from Google’s Keyword Tool when exporting keywords. It is the average number of searches performed each month for a keyword. Some months may be higher or lower, but this represents the yearly total divided by 12. This is based on the previous 12 months of data and is affected by the criteria you have selected but refers only to the search network (and search partners if selected). This data comes as standard from Google’s Keyword Tool when exporting keywords. This is an indication of how competitive a keyword is (considering the location and targeting options selected). This is a very broad indicator and provides little to no practical application in the real world. Any keyword for which you are already ranked number 1, suggests that you are already optimised for this… You might want to note the ranking URL to ensure that any changes in keyword mapping don’t damage these rankings. 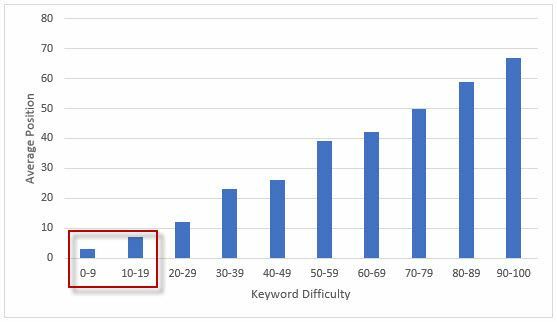 The above chart showing some example date, would indicate that the site in question is only competitive at very low keyword difficulties; anything greater than a KD of 20 and we can expect to be on the second page of Google or lower. *if you are paying for the keyword rankings or are limited to monthly usage caps, you may want to perform this action once you’ve filtered out everything else. This is reference to one of Moz’s metrics, but other tools provide similar metrics, if all else fails you could use Google’s competition metric! We want the search volume to be high and the difficulty to be low, so if we divide the Search Volume by the Keyword Difficulty and sort from highest to lowest, we should see; the most valuable / most easy at the top and the lest valuable / most difficult at the bottom. This is just formulaic way to analyse large amounts of data quickly, while deriving reasonable insights in the process. Remember, if you are dealing with thousands or tens of thousands of keywords, which is not unusual, you cannot look at each one and all of the data to make decisions. For more information like this, read our guide to keyword data analysis. *It’s also worth noting at this point that you can pull in any data you like about the keywords from any source, if you feel that it will help to provide a better analysis or produce better target keywords. Keep in mind though that weighting or applying formulas to multiple datasets with different metrics for the same concepts can in some cases only muddy the waters. This is a good point to start removing keywords from the list, there are many approaches here, but we recommend keeping a complete unfiltered list in a separate file. This is useful if you change your mind or somehow damage the integrity of the data. There is certainly no one-size-fits-all approach here, but you will typically use some of the following criteria to remove keywords from the list. The aim is to remove ones that are of no value to you for any reason. We would not remove keywords based on a lack of relevance at this point, do this after the next step to save time. You could structure either in any way you want, the important thing is that you are consistent in your application of the labels. Add as many categories as you need to properly categorise your keyword data. We provide a tool for this, or you can use a spreadsheet (download one from here). This will allow you to very quickly and easily create categories and labels for your keywords; as it automatically applied the specified labels to keywords containing the specified text. As you progress, filter on categories to look for keywords that have been assigned no category, these are usually marmite… Because these keywords are ones that you hadn’t anticipated, they are often the most interesting or the least relevant! You need to spend a little time thinking about you will address the structure of the categories, a poor implementation initially can lead to redoing work or an illogical output. One advantage of this technique is the meta-analysis that it allows us to perform on this data by segmenting it by category or label… Read more about this is our guide to keyword data analysis. Look for patterns in the words that are irrelevant to your business and systematically remove these using category filters. By the end of this phase you should have a list of keywords that are relevant and have data that falls within your preferred ranges… This should be getting on for a pretty good list from which you can pick your target keywords. *A note on relevance, if you’re researching keywords in a region that you do not live in, consider there will be colloquial variations as well as differences in spelling. Also, if you are working in a new industry, you may have to go back to a client or colleague to ensure keyword relevance… In fact, this is a great exercise in getting across the keywords in an industry for a client. This step is optional, but like to apply a formula or in some cases several to the data in order to create a score… There is no right or wrong way to do this as such, the formula should broadly indicate which keywords are the most valuable… This should be weighted to include current rank, keyword difficulty, and search volume. If you have created a category for relevance or commercial, and you have labels for all keywords; you can factor this into the formula. There is no way to formulaically derive a keywords relevance in Excel, but you can do this with labels easily enough. You can also use this score to remove or filter keywords from the list, but at this point all of the keywords should be relevant, achievable and valuable to you, so there isn’t much point removing any. Again, we cover these more advanced concepts in our guide to keyword data analysis. You can pick x number of keywords per category or label, or you may be limited by the number of pages that you have available to map keywords too. Use the scores and data to determine what are the best options for you at this time, it’s not cast in stone and can change over time! At this point you should know what keywords are worth targeting, which are commercially valuable, which you are unlikely to be able to rank for, etc… There is no magic formula that can finalise this list, ultimately you will need to use your eyes and brain to pick your target keywords.